It’s day 5 since my chemo cycle #5. Most of the days, I am so darn tired and feeling nauseous. I’ve been fighting the ongoing headache that stays with me regardless how much I rest or sleep. I won’t let this headache get to me. It’s time to pen down my chemo session number 4. My doctor was taking an early Christmas vacation till 20 Dec. 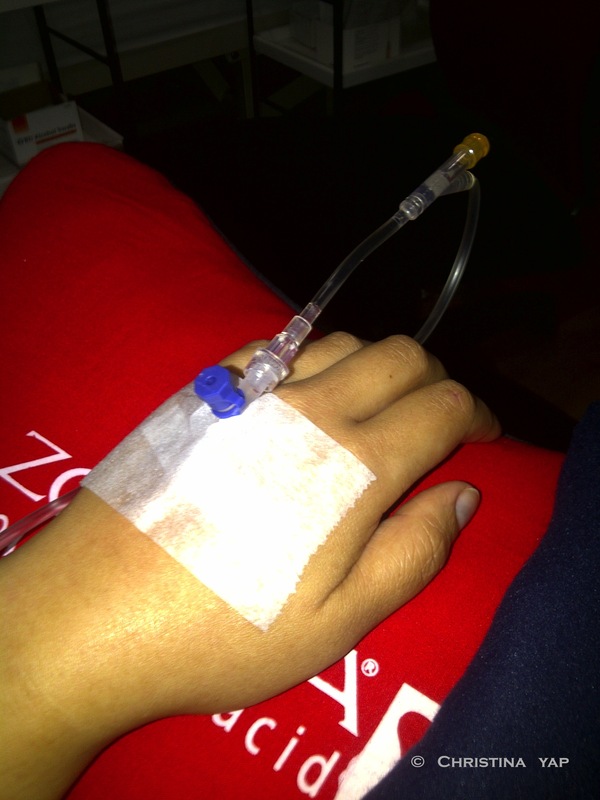 This mean I had to postpone my chemo session from 14 Dec to 21 Dec 2010. Yep, it was too close to Christmas but I had no choice. The appointment was set at the usual timing of 10am. Grabbed my smaller cooler bag and left the house by 9.15am. Arrived on time and this time, I had my favourite nurse from the lab to take my blood. She sat down next to me and took out the necessary equipment ready for the extraction. It took her a few moments to find a good vein and insert the needle to fill 2 tubes. I didn’t feel the needle at all – it was painless! Phew! Once the band aid was applied, I rested for a few minutes before leaving the clinic to grab my morning meal while the tests are carried out. Was getting a little peckish. Time to see the oncologist to review the blood test results. She was concerned that my white cell counts was low and contemplated to delay the session if other factors in the blood test was not good enough. I was having a runny nose over the last week leading up to this session and this contributed to the less desirable results. Luckily enough, the remaining blood work was satisfactory to continue. I just had to let my body battle the sinus on its own. The other important result in blood test is the tumour markers otherwise known as CEA. The markers have reduced to 17.4 from 26.0. It is always a good sign to see this number decreasing. A big sigh of relief. Time to start the chemo. There was another patient who had a head start. Took my place at the back sofa while the nurse rolls out the drip. We’re choosing the left hand as the lucky hand to insert the needle. As usual, I was squeezing away my little red heart to aid in finding a good vein. Tap, tap, tap and alas she thinks she finds one. She sprays my hand with some antiseptic and the needles goes in. I look straight, take a deep breath and think nice thoughts. I could feel the pinch when it hits my veins. Thank goodness the pain was bearable. Somehow I always find a way to take a single-handedly take a picture with my phone to mark the memory. That’s just me! Luckily, I had my book with me. This time I was reading up on a book about stock market wizards – intriguing. Even had time to chat via instant messaging with some friends. That certainly helps me to pass the time. In the first hour of the treatment, I could feel my chest getting very warm. It was getting uncomfortably warm and for a few moments found it hard to breath normally. I remained calm as much as possible. I gathered that the drugs are just working through my body. As I expected, it took around 2.5 hours to complete this session. I left the clinic shortly after picking up my medication for the next week and confirming the next appointment. I was feeling a little chilly and craved for some hot soup to warm my body. As long as I can remember, this would be my first Christmas where my mood is not very festive at all. Even though we had guests over, I spent a lot of time in bed resting and sleeping. I had to avoid crowds because I fear of catching any colds or fever. The finishing line to the end of my chemotherapy is in sight. Just 2 more sessions to go.